WOW - Time sure does fly. It seems like we just celebrated the New Year and now summer is almost here. 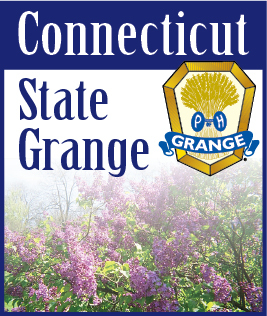 Mark your calendar for Sunday, June 13th and be at Good Will Grange Hall in Glastonbury for Grange Sunday. Our Worthy State Chaplain, Amy Whitcomb, will start the day with her church service at 11:00 a.m. followed by a Lasagna Dinner put on by the Grange Youth at 12:00 noon. At 1:00 p.m. we will have our Talent and "A Number" Contests. Does your Pomona have an entry? The winner of the Talent Contest will compete in the Northeast Contest which will be held at Lecturers' Conference in Randolph Center, Vermont the first week in August. We all need to put our best foot forward and show off our Talents. This is also a great time to bring along a non-member or two and show them what a great group of friendly people Grangers are. Speaking about Lecturers Conference - Details are pretty well set. It will be held August 2-5 at Vermont Technical College in Randolph Center, Vermont. A few new ideas are being tested this year. Instead of an Early Bird Workshop, there will be Early Bird Area Tours (on your own) to an Antique Music Box Company, an Antique Clock Shop, and a Vermont Veteran's Cemetery. More information on this will be available to those attending. Connecticut will rehearse their program at 1:15 p.m. on Tuesday, August 3, with the program beginning at 2:15. Northeast Night, which includes the Talent Contest, will be Tuesday evening. The Banquet is entitled "Blue Jeans, Denim, and Calico". Entertainment will be by the Vermont Fiddlers Association, a barn dance. There will be contests for "Boots, Buckles & Bonnets". If you are a Lecturer or if you attended last year, you should be receiving your packet on the conference about the same time as you read this. Looking ahead - Don't forget Let's Celebrate on July 24th at Cheshire Grange. We have a Barbershop Quartet to entertain us as we celebrate our Grange successes New Orleans style.